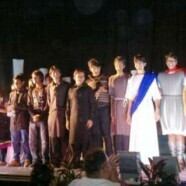 On 6 December 2013, the Christian Life Program presented its annual Christmas play. The cast and crew of the play had worked hard in order to provide a quality show with a valuable message that all believers are ambassadors of Christ’s message. The play included many innovations, black light show and shadow mime and also an aerial act. There were two shows. The first one was at 1:00 pm for students and staff and the second show was at 7:00 pm for the junior staff and families. The play was enjoyed and appreciated by everyone.